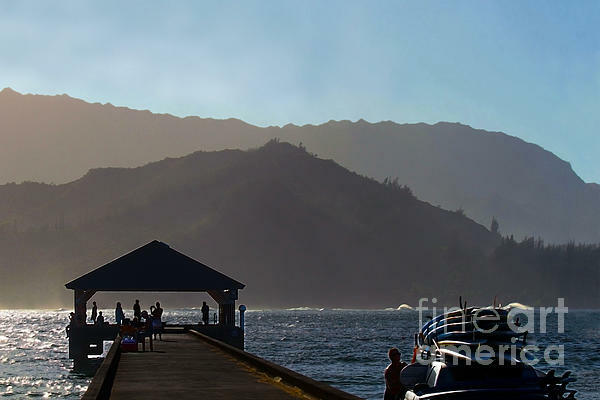 "Hanalei Pier in Kauai, Hawaii" by Catherine Sherman. The historic Hanalei Pier in Kauai is always a hub of activity. 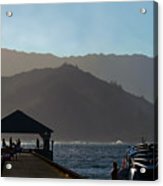 This popular Hawaiian landmark was once a busy working pier used to load and off load sugar and other goods to and from ships. A concrete deck replaced a wooden one in 1922, and the canopy recently was renovated. 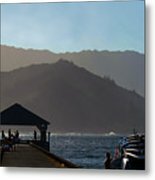 Hanalei Bay is the largest bay on the north shore of Kauai island in Hawaii. 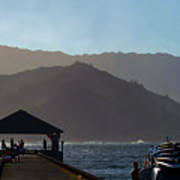 The town of Hanalei is at the midpoint of the bay. 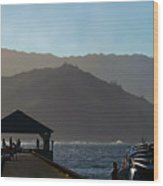 Hanalei Bay boasts nearly two miles of beach, surrounded by mountains, and is perfect for stand up paddle boarding, sailboats and swimming. In the winter, the surf is higher, attracting many surfers. The 1958 film "South Pacific" was filmed at Hanalei Bay.